Let the record show that Eve is in a panic. 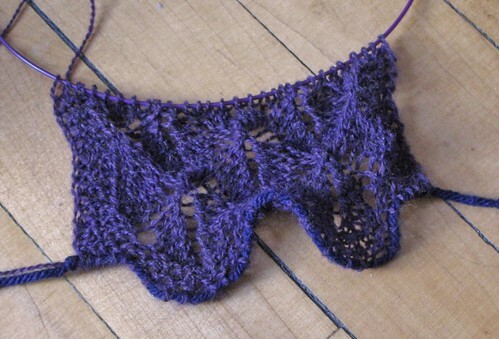 She has 1.5 repeats finished on the SWATCH for the Myrtle shawl, and she has to finish the actual shawl itself in two (2) weeks if she wants to wear it to the garden party. This is so not happening. A shawl with lace in every row is never a good idea for a deadline, and she has decided to scrap it in favour of a faster project. To this end, she has prepared a poll and is requesting your opinion as to the best project to knit: Shetland Triangle, Japanese Feather Stole, Lace Dream Stole, a lace parasol based on Victoria, or Orangina. Results will be tabulated at the end of the weekend. This entry was posted on July 13th, 2007 at 12:36 pm and is filed under Future Knitting Plans, In Progress, Mittens, Orangina, Rule 30, Scarves & Shawls. You can follow any responses to this entry through the RSS 2.0 feed. Both comments and pings are currently closed.